The Microsoft Sculpt Ergo puts your hands in the most natural and comfortable position. This post was done in partnership with The Wirecutter, a list of the best technology to buy. Read the full article here. 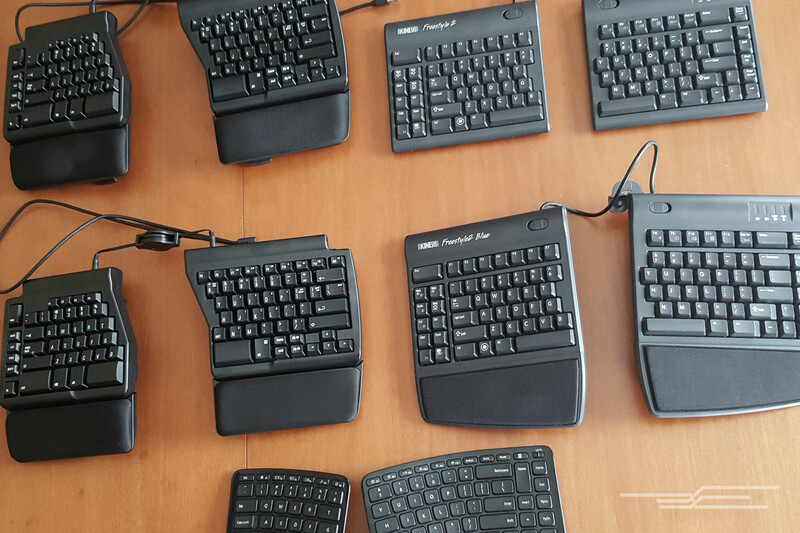 Of the dozen ergonomic keyboards we've tested since 2014, the Microsoft Sculpt Ergo is the most comfortable model for most people. It's the only one to meet all of our ergonomic criteria, including a separate number pad and support for both negative tilt and vertical "tenting." 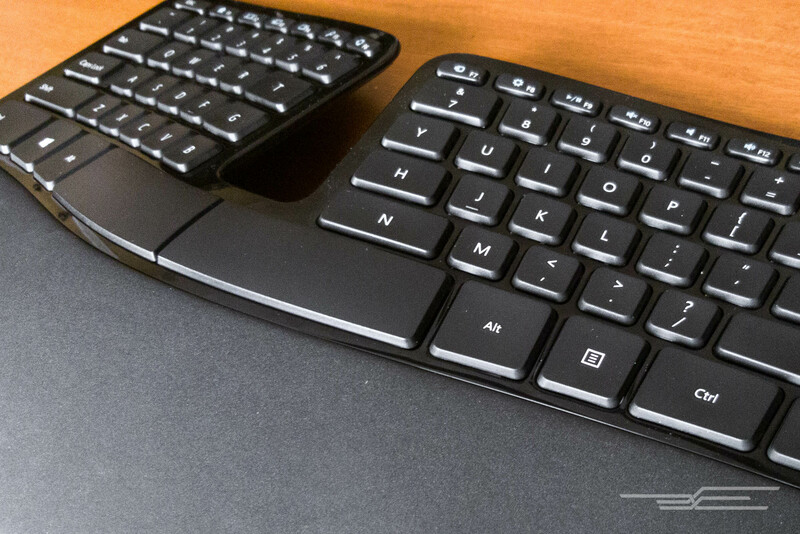 The Sculpt Ergo's manta-ray-like design puts your hands in the most natural and comfortable position for long bouts of typing, and it's a solid wireless keyboard with keys that are crisp and satisfying to press. If you type often and are concerned about your posture or experiencing hand, arm, or shoulder pain, an ergonomic keyboard can help you better position your body. Although there's no clear evidence that ergonomic keyboards can prevent carpal tunnel syndrome or other kinds of repetitive-stress injuries, alternative keyboards can help reduce strain. If you've been diagnosed with carpal tunnel or RSI, consult your doctor for advice specific to you. Regular keyboards can force your hands closer together, causing your wrists to bend to the side unnaturally. This bending is called ulnar deviation, and the position puts pressure on your ulnar nerve. To counter this effect, most ergonomic keyboards split their layouts and position keys at an angle so that your hands can lie flat on the keys. Another common issue is extension—bending your arm upward at the wrist so that your fingers can reach keys on a keyboard that's taller in the back—which puts excessive pressure on the median nerve. You can alleviate this condition by using a keyboard with negative tilt, which prevents extension by angling your forearms slightly downward. In most cases, if you improve your posture and select a different keyboard, you can find some relief. Check out our full guide for more information on proper keyboard ergonomics. Based on advice from experts in ergonomics and keyboard design, we looked at ergonomic keyboards with a split design (whether a fixed or complete split); a low profile; clicky, responsive keys; a negative tilt; and no built-in numeric keypad, so you can have the mouse closer to you. We researched 21 models and then tested four by using each keyboard for four days to write, email, and browse the Web, switching to a different keyboard halfway through each day so that each keyboard got equal time in the mornings, when there was less likely to be fatigue, and in the evenings, when achiness was most noticeable. Since comfort is subjective, we also consulted the opinions of a five-person testing panel to compare their opinions on each keyboard's comfort, feel, and efficiency when typing. The Microsoft Sculpt Ergo is the only keyboard we tested that offers both tenting—rotating the wrists properly to avoid ulnar deviation—and a negative tilt to prevent extension. The Sculpt Ergo also includes low-profile, clicky keys, plus a number pad that's separate from the main keyboard. It meets all of our ergonomic criteria for less than half the price of our other main contenders. Most people who don't already have consistent keyboard-related pain will likely find it more comfortable to use for hours on end compared with a traditional keyboard. 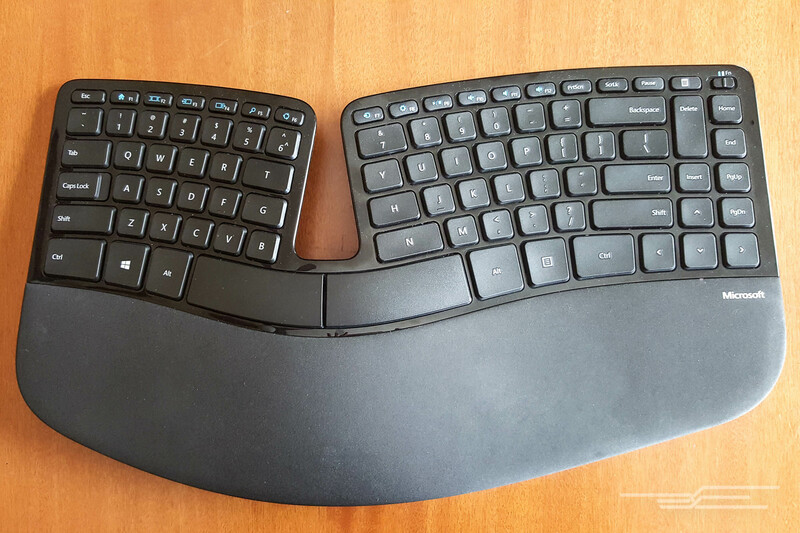 In my testing, the keyboard's large, curved palm rest was comfortable to rest my hands on, and the keys were responsively springy and easy to press. Because the Sculpt Ergo's keys are shallow and laptop-style, I didn't have to bend my wrists excessively upward to type or to rest my fingers on the home-row keys. After full days of typing on the Sculpt Ergo, I felt very little, if any, increase in fatigue or achiness in my hands or elbows compared with using a regular keyboard. The one drawback of the Sculpt Ergo is that it's a fixed keyboard, which means you can't adjust the angle of the negative tilt or tenting, nor the distance of the split between the left and right sections. While that design makes the keyboard easier to set up and use for most people, if you have broad shoulders, suffer from shoulder pain, or tend to rotate your wrists more, you should opt for a fully split, adjustable keyboard. If you have consistent aches while typing, if you need more customization, or if the Sculpt Ergo doesn't fit your body's ergonomic needs, the Matias Ergo Pro may be better for you. The Ergo Pro is a fully split mechanical keyboard with layouts for both Mac and Windows. You can tent the Ergo Pro's keyboard halves or tilt them away from you, and the completely split design means you can position the keyboard halves for optimal wrist, shoulder, and arm comfort. 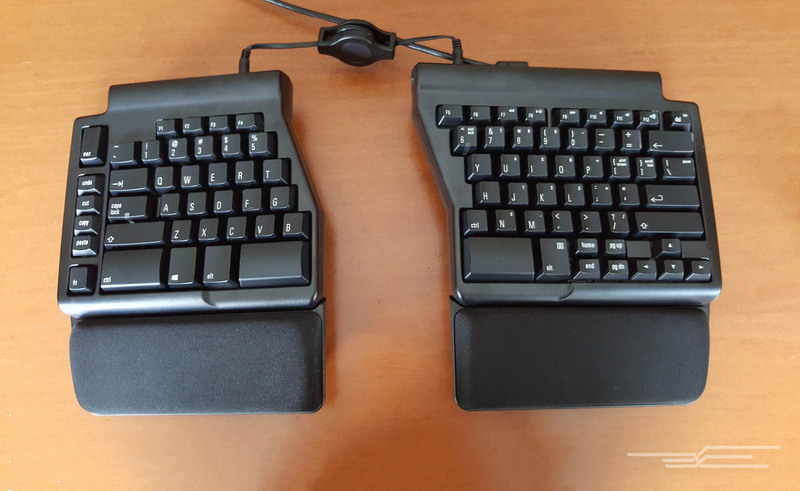 Unlike the Microsoft Sculpt Ergo, the Matias Ergo Pro doesn't support both tenting and negative tilt at the same time. But because it's more adjustable than the other models we tested, the Ergo Pro is more ergonomic for a wider swath of comfort needs. If you want a fully split keyboard without lots of messy wires, or if you'd like to use the keyboard for both your computer and your mobile gadgets, the Kinesis Freestyle2 Blue—available in Mac and Windows versions—is your best option. The VIP3 accessory is a must-have for getting the most ergonomic benefits from this keyboard; with it, you can tent the halves to a steeper angle than our other picks. 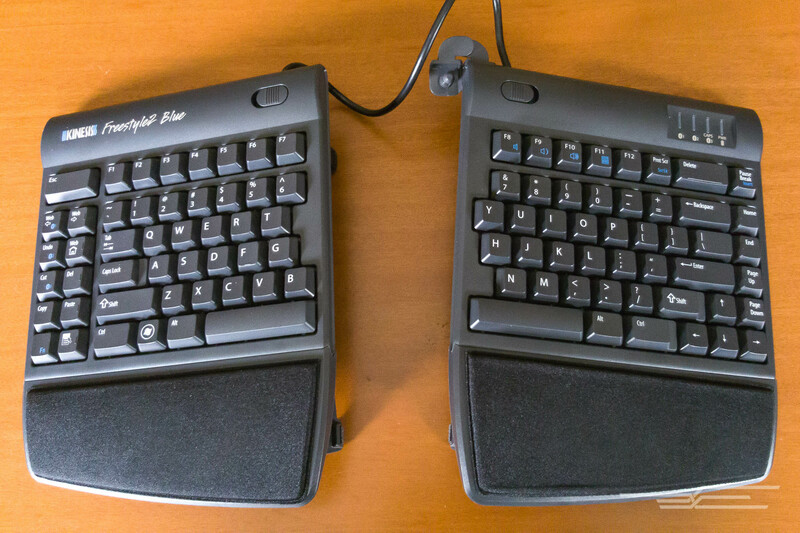 While the Freestyle2 Blue's keys were our least favorite among our picks, the keyboard worked flawlessly for typing on a desktop computer and on mobile devices. This Bluetooth model connects wirelessly and supports multi-device pairing, and the fully split design lets you customize the position of the keyboard halves. If you frequently switch between devices or you hate messy cables, the Freestyle2 Blue is the best wireless ergonomic keyboard we've seen.